Our first national gathering took place at Maryhill Burgh Halls in Glasgow, on 6th March. Thank you to everyone who came along and helped make the day a great way for our members to meet up, share learning and ideas, and help shape our priorities and workplan for the next year. 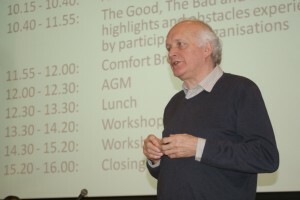 This post has a summary of the gathering, plus links to various presentations, reports and organisations, to help share some of the learning from the day. Please get in touch if you’d like any more information, or you have any ideas for next year’s gathering! The gathering started with a presentation by our (outgoing) Chair and Vice-Chair, Suzy Goodsir and Philip Revell. They talked about the need for and history of Scottish Communities CAN, and about our achievements over the last year – those are summarised in our Annual Report. (You can read more of the background on the About Us page of our website). The other main session of the day was The Good, the Bad and the Ugly, facilitated by Alan Caldwell. Alan encouraged us to tell our community or project’s story and identify the highlights, low points, and the common barriers that we face. Scottish Communities CAN will use Alan’s mindmap notes from that session to shape our priorities and workplan for the next year. 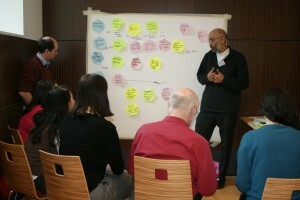 Delegates also took part in two workshops, out of a choice of seven. Working with Energy Saving Trust and Energy Saving Scotland advice centres: successful collaboration? 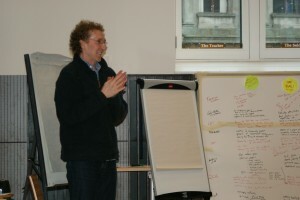 Osbert Lancaster led a discussion about working with partner organisations, in particular the Energy Saving Scotland advice centres, thinking about what worked and what could be improved. This workshop was part of a joint Energy Saving Trust / Scottish Communities CAN research project that will inform EST and ESSacs’ future support for communities. Many groups enjoy a good, collaborative relationship with their local authority, showing the great potential for what can be achieved when working in partnership. This session allowed us to share experience and discuss top tips for new and existing groups. Elizabeth’s slides and notes from the workshop are available here; the workshop will feed into our Local Authority research project. Two of the Comrie team shared the story of the progress and pitfalls of the first five years of CDTs’ experience in working towards financial sustainability, and explored how the Trust’s experience could relate to other communities considering their own development. Their slides are available to view here (4MB PDF). Community Hubs – what are they, might they work, and if so where? What is the Green Deal? with Karen Hilton of Towards Zero Carbon Bute. This workshop gave an introduction to the Green Deal/ECO/Affordable Warmth/Carbon Saving Communities Obligation, and discussed ideas on how community groups or social enterprises could benefit. Greenspace Scotland’s new community tool-kit was introduced. It aims to get communities ‘growing everywhere’ by helping them to explore the different places and ways that they can grow food in their own local area or neighbourhood.